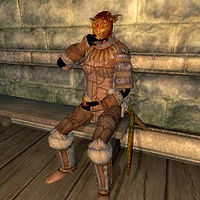 Rana is an Argonian lieutenant working for the Blackwood Company in Leyawiin. She is a skilled Nightblade that you will have to fight during the final quest for the Fighters Guild. Rana spends almost all of her time wandering around the Blackwood Company hall. The only time she stops this is when she has a two hour lunch at noon. All of Rana's equipment is leveled, which consists of light boots, gauntlets, greaves, cuirass, and helmet. She will either use a staff or blade in combat. Besides that she carries middle class pants, upper class shoes, and a middle class shirt, as well as a small amount of gold. She also knows a leveled set of nightblade spells, as well as one extra major Alteration spell. Speaking to Rana will occasionally have her greet you by stating her name and title: "Lieutenant Rana, Blackwood Company." Asking her about Leyawiin will have her explain how she serves Blackwood Company; "My duties are primarily... administrative. They keep me busy here in the Leyawiin barracks."